I used to love tracking down bargains and playing the bidding game on Ebay but lately I've gone off it. The last 6 items I've bought were ALL faulty, I've received refunds for them all but it kinda destroys the fun. Even though I received refunds there's still a BIG downside to this. Let's say I order something expensive next time and it arrives broken/faulty, I apply for a refund and the seller refuses so I ask Ebay to intervene, Ebay may decide I'm the one doing the scamming based on my history of claiming refunds for the last 6 items. Well, I finally got my RAM straightened around - what a nightmare. Anyway, back they went to the seller - and I bought 3 matching unbuffered Hynix sticks from a third-party reseller on Amazon - upgrading my doorstop to 8GB. I dunno... I guess I'm a sucker for HGST HDDs. I looked hard and long at WD Blacks, but I just couldn't pull the trigger. Anyway, my latest HGST 1TB 2.5" HDD arrived today - It's the same identical model that I'm using in my daily driver desktop machine. This will be going into my 'Road Warrior' Dell Latitude E6430 as a secondary storage/data drive. It replaces my former CD/DVD burner, location-wise. The curious thing about all of this is, I was under the impression that they stopped making these particular HDDs when WD bought HGST. I incorrectly assumed the date of manufacture on this drive would be 2013-2014. Wrong! Please excuse the fuzzy, oddly colored pic. I haven't removed the drive from the anti-static shipping pouch yet. 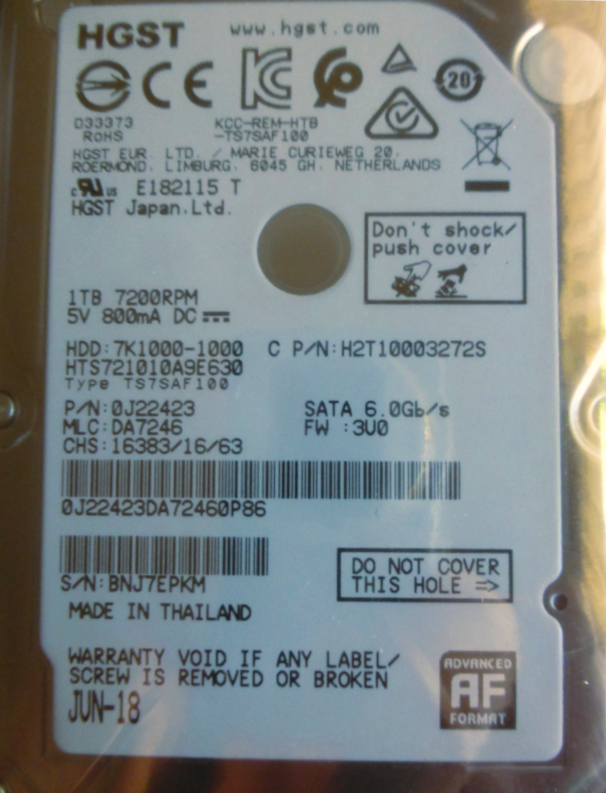 Depending on how you want to look at it, I got this HDD for free, from Newegg. A couple of months ago, I bought a new set of tires for my ride - Barum Bravuris 3HM - not easy to find in dusty Arizona. Most Yanks have never heard of them. And, the dealer gave me a $75.00 rebate gift card. I hate rebates and wanted to blow it off, before I forgot about it. What better way to spend 'found money' than to buy a couple of pizzas (10 seconds on the LIPS; a lifetime on the HIPS), and a new HGST for the baby? It's all fungible, in the end, right? Okay my interest is peaked now .. why those specific tyres ? Where'd you find them @ VinDSL? I've had great luck with Continental tires (Contis). I had 96000 miles on the original Contis that I replaced, and they weren't down to the wear bars yet. No kidding. But the pavement temperature in Arizona made them hard as rocks, over time - think 'The Flintstones'. They became so hard and noisy that it sounded like I had a bad axle or CV joint. So, why did I replace them with Barums (pronouced Bah-room)? I bought my ride with 13k miles on the odometer, and the previous owner must have run over something - objects in the roadway being another problem on Arizona freeways - right, spence? I must have dodged 50 aluminum ladders over the years - even dodged a porta-potty laying sideways in the middle of the freeway, once. Fell off the back of a transport truck, on the way to an event or whatevs. You're lucky if your windshield lasts a year here, from all the flying stones and metal. I replaced my windshield 3 months ago, and got another rock last week. Guess I'll call the insurance company Monday. Thank gawd for zero-deductible windshield replacement. Anyway, the previous owner replaced one of the Contis with a Kumho - probably the cheapest, worst tire known to mankind. It was down to the wear-bars @ around 30k. I replaced the POS Kumho with a Barum, which is made by Continental and sold primarily in Eastern Europe. The Barum felt just like the other Conti tires on my ride. So much so, that I decided to put 4 new Barums on my car, and keep the other Barum for a full-size spare. LoL! When I pulled out of the tire dealership, with four new Barums, I couldn't believe my ears. They were sooooo quiet that I could hear my engine, which is normally quiet as a church mouse. No fart can muffler on this car, yet. @spence, I bought them at Discount Tire Store - I always buy their certs, too. Almost anything I run over renders the tire(s) irreparable, so it's cheap insurance. AFAIK, they're the only store that sells them locally. I think Continental makes them especially for them, but that's just an educated guess. And @VinDSL isn't lying when he says we dodge all kinds of crap on the highway here... ladders, furniture, never mind the stones. About two weeks after we bought this brand new car, in the space of 5 miles we swerved all over the highway to avoid a tractor trailer tire blowout that still managed to slam the front of our car AND then a flying refrigerator! At the tail end of that same trip, we had to swerve to avoid another tractor trailer tire blowout in progress. Off the road and we managed to avoid it, but the curb on re-entry tore up the front end... two week old car then needed nearly 6 months for full repair to be completed... hubster was pretty despondent "First time I buy a new car in 30 years, guess I'm not allowed have anything nice"
Can I ask how much tyres are over there .. I mean roughly how much would 4 tyres for an average car be over there ? A quick 'google' seems to suggest we may have found the one item it might just be cheaper to get over here .. but I could be wrong as I'm finding it difficult to find websites in the US that actually give prices, they nearly all say "phone for a quote" (which in itself often means "we're too scared to tell you"). 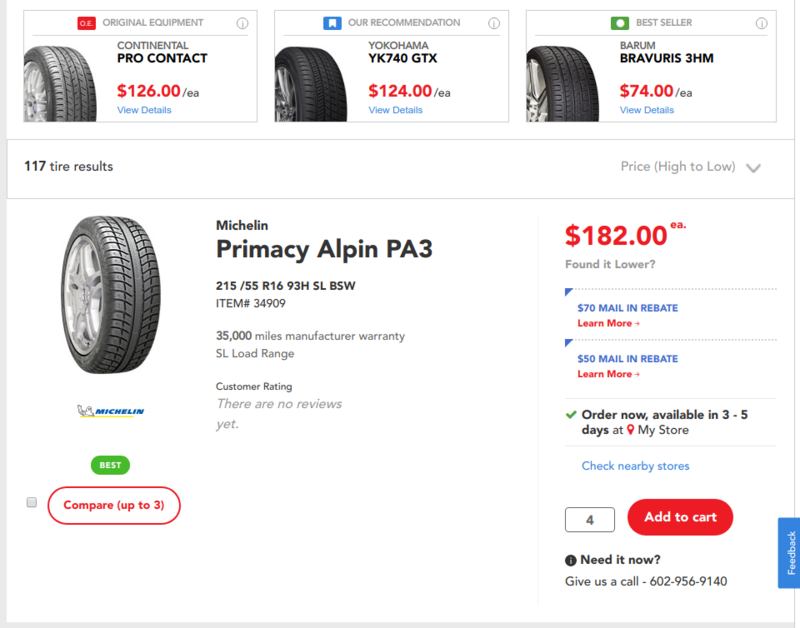 are these average prices for a all weather tyres ? How about prices for tyres from the big boys .. Continental, Mitchelin, Pirelli, Goodyear, etcc. LoL! I always ask salesmen how much, for instance, their $74.00 tires cost. They look at me like I have two heads. "Um, $74.00?!?!?" Then, I quip, "No. how much are they with all the hidden costs." The large tire pictured below is the most expensive tire they sell, in my size. The Conti Pro Contact, in the upper-left, is what I would have bought, if the Barums weren't available. It's the OEM tire that I ran for almost 100k miles. The tires on the top-right (labeled BEST SELLER) are what I put on my ride. When I was buying them, the salesman said the base price is actually $70.00, not $74.00. I always buy the certs - so, that's $13.50/tire, or $54.00 total. Then, there's the mandated state environmental fee - $1.40/tire, or $5.60. Then, there's the disposal fee - $2.50/tire - I kept one, so $7.50. Oh, then there's the installation & lifetime maintenance fee - $20/tire, or $80.00. And, finally, there are the state & local taxes - $29.36. Let's add it up. I paid a grand total of $456.46 for 4 x $70.00 (adjusted price) tires, or $114.12 per tire. To be fair, I should deduct the $75.00 Visa rebate card that I had to apply for, and wait 6 weeks to receive in the mail. A couple of pizzas and a free 1TB HGST TravelStar is worth the hassle, I suppose. It's that self-delusion of getting something for nothing that we all seek, right?